This nikujaga recipe is a true Japanese winter warmer. 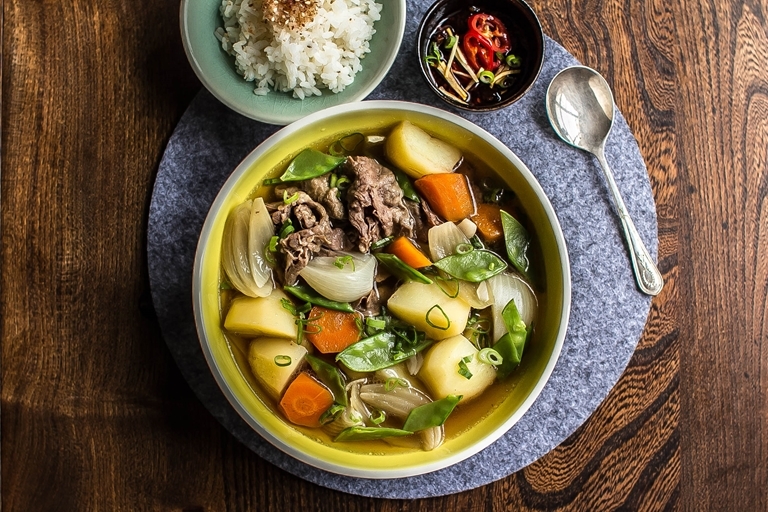 A classic beef and potato stew, this dish is flavoured with dashi, soy and sake for a flavourful and restorative broth. Nikujaga, literally meaning meat-potato, is perhaps one of the most straightforward and comforting dishes in the Japanese repertoire. It's traditionally made of meat, potatoes and onion stewed in sweetened soy sauce, sometimes with konnyaku, a gluten-free noodle made from yam. Potatoes take centre stage in this dish, with the meat mostly serving as a source of flavour. Very thinly sliced beef is the most commonly used protein, although minced beef is also popular. In eastern Japan, sliced pork is often used instead. Nikujaga is a simple, home-cooked winter dish, often served with a bowl of white rice and miso soup. It is commonly served in izakayas, the casual Japanese eateries frequented by those wanting to unwind after work. It's high on energy, low on prep time and irresistibly appetising. This dish tastes even better the next day, so you can make it in larger quantities then warm it up and serve with some rice for lunch.